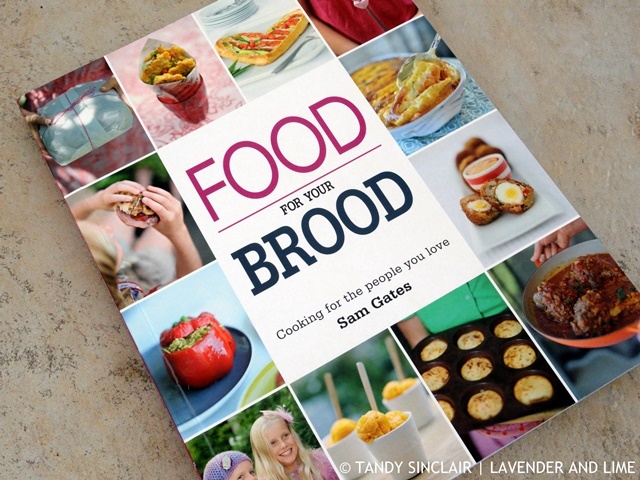 Food For Your Brood is subtitled Cooking for the people you love, and here Sam provides recipes where she aims to create exciting, everyday food. The recipe book itself has an introduction and is divided into themes, each one having its own introduction. Food For Your Brood starts with Best Breakfasts and out of the 8 recipes, my interest was sparked by the homemade baked beans (p24) which forms part of the recipe for sweet potato and leek cakes. I do not like the smell of commercially produced baked beans as they remind me of a visit to a canning factory. I made the baked beans, which I had to simmer for 15 minutes more than the recipe stated, but that probably has to do with the temperature of my stove setting. This is followed by Superhero Soups, and from these 5 recipes I would try the white bean and onion soup with fresh thyme (p34). 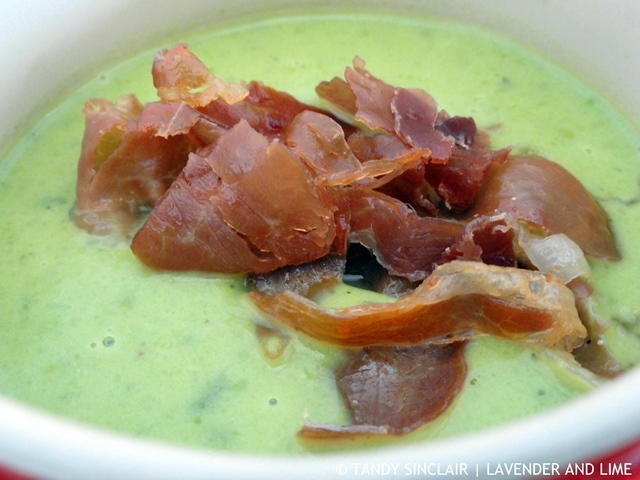 I made the perfect pea soup with Parma ham (p37), as the store bought pea and ham soups just don’t cut it for me. I choose my recipes to test based on their titles only and not on the recipe ingredients and wording. Sam uses spoon measures for her butter, and I would prefer grams. When testing the pea soup recipe there was no indication of how to cut the onion. I would call this pea soup with a Parma ham garnish. Dave and I found it very sweet and lacking in ham flavour. The next lot of recipes are Light Lunches And Sublime Suppers (6 recipes) and Patties, Cakes, Fritters And Other Crunchy Flat Things (6 recipes). On my to try list from the 9 recipes in Better Outdoors: Picnics And Braais would be the lightweight’s chicken with coriander-flecked marinade (p79) and show-off’s Caesar salad (p90). These recipes are followed by 8 Smug Oven Bakes For Time-Poor Cooks and I would be tempted to try fiery pumpkin, sausage and hellfire vegetable tray bake (p115) if Dave ate pumpkin. In the 8 recipes for Sofa Food For Wintry Nights I love the sound of the all purpose pad Thai with super speedy peanut sauce (p122), but will have to give it a miss as peanuts in a sauce is not one of Dave’s favourites. 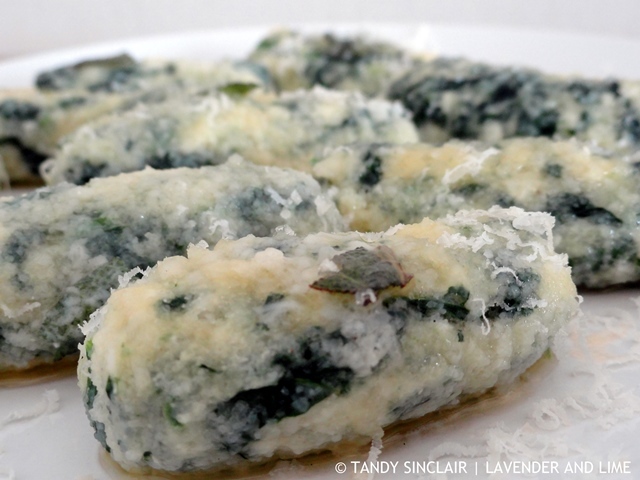 However, I was sure he would love the squodgy spinach gnocchi with sage butter (p132) so I made these. I used less spinach than Sam only because our local store sells baby spinach in packs of 400g and I was not going to spend another R40 for 100g. These were delicious and worth making again. The photograph in the section titled Let Them Go Food For Fledglings reminds me of Gordons Bay. In these 7 recipes I am reminded that I have been meaning to make pasta with herbs which Sam calls stripy pasta (p138) and that I have also wanted to make party pot stickers (p142). Broods On The Run (4 recipes) is a great chapter for me, as I do a lot of eating at my desk or in my car. Another recipe I have on my list is monster sausage roll (p156) as well as mini scotch eggs with harissa mayonnaise (p160). Sam ends with 11 recipes in the section titled Sweetness. The labyrinth biscuits (p172) caught my eye as well as the chocolate and hot mint slices (p181). I totally agree with Sam’s sentiment that children should learn to cook from an early age. This encourages them to have a broader eating habit. Each recipe has its own description and the photographs in the book are lovely and homey. I especially loved the photograph of Auntie Gladys’s handwritten recipe for fork biscuits (p168), which must be priceless. 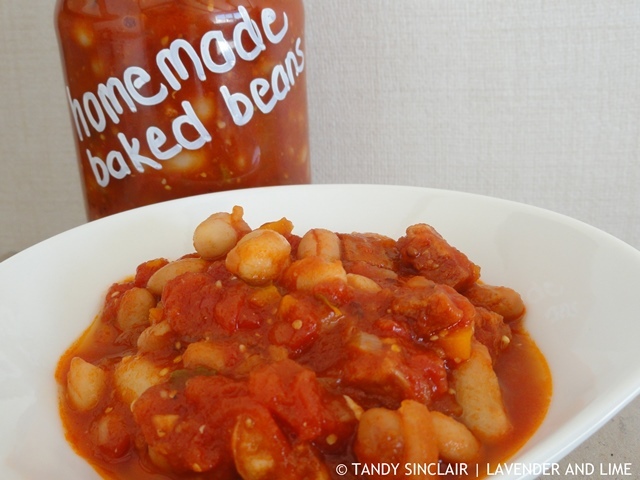 I do love homemade baked beans – never bother with the canned ones either! I think a lot of people would agree that hammy is a word! I am hoping to share the recipe soon! fiery pumpkin, sausage and hellfire vegetable tray bake would work perfect for me! Wow Tandy, sounds like you had fun experimenting with lots of different types of recipes. I totally agree, I try to keep the girls in the kitchen with me at all times, just to start them on the path to cooking. It’s messier but hopefully they’ll a few things along the way.